Auliʻi Cravalho wears black zipper high top Converse All Star “Chuck Taylor” sneakers in the series. 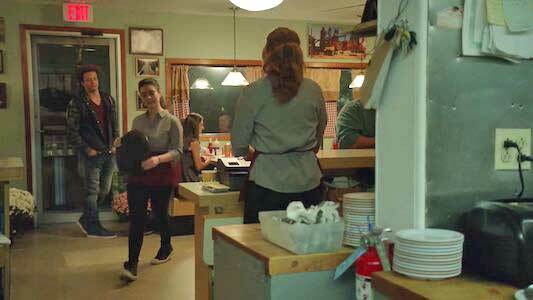 Shannon Purser wears maroon high top Converse All Star “Chuck Taylor” sneakers in the series. The cast of Stanton High’s Spring Awakening. Musical theatre has a special place in the hearts of many. 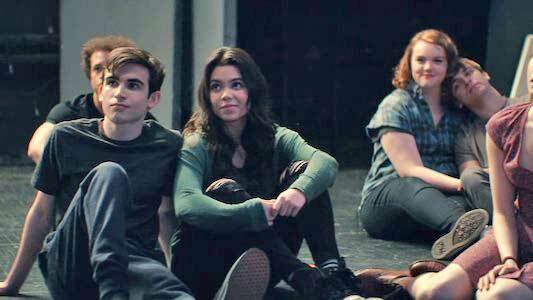 For some, high school theatre was a time of growth, acceptance, and learning about oneself. 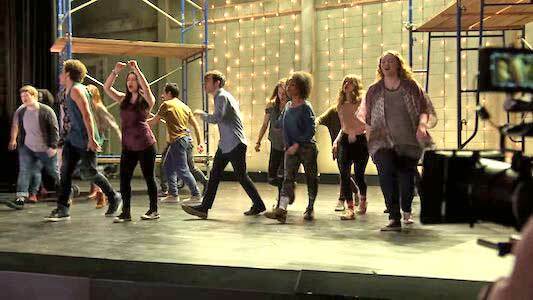 The power of musical theatre is evident with its recent resurgence in pop culture over the past decade with the success of shows like Glee, films such as Mama Mia and Hairspray, and Broadway shows like Hamilton and Dear Evan Hansen. This has led to musicals coming back into the spotlight, which is where the NBC drama Rise comes into play. Debuting in March of 2018, Rise is a show about bringing people together through the power of musical theatre, overcoming racial, gender, and economic boundaries. Stanton drama sings the national anthem at Robbie’s football game. The show stars Josh Radnor as Lou Mazzucchelli, an English teacher at the local high school in the fictional town of Stanton, Pennsylvania. 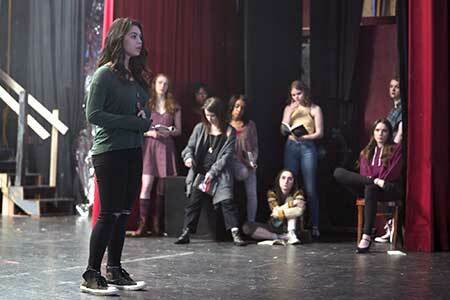 Lou volunteers to take over the Stanton drama program, hoping to revitalize it and unite the school behind a production of the musical Spring Awakening. By doing this though, he jumps in front of long time assistant director Tracey Wolfe (Rosie Perez), who was pegged to be the next director before Lou stepped in. Although reluctant at first to help Lou, she eventually sees that he means well and aids him in his daunting task to bring the play to life. It is quite the daunting task too, as Spring Awakening is a controversial piece of art in the small, conservative town of Stanton. Much of the show focuses on the problems that the townspeople have with the production, including its homosexual characters, racy scenes, and mature subject matter. Lizette wears black zip up chucks throughout most of the show. To bring this story to life, Lou and Tracey enlist a talented group of veteran and rookie drama students. This include Robbie Thorne (Damon J. Gillespie), the starting quarterback of the Stanton High football team, who is cast in the lead role of Melchior against the wishes of his head coach (Joe Tippett). Robbie’s struggle of maintaining responsibilities to both his team and fellow cast mates is one of the show’s main plot points. There’s also Lizette Suarez (Auliʻi Cravalho), a high school student who is cast in the lead role of Wendla. Lizette is a girl with big dreams, who feels held back by the town, her job, and her mother (Shirley Rumierk). 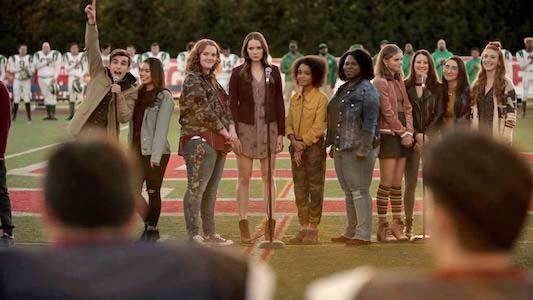 The rest of the student body is made up of Simon (Ted Sutherland), Gwen (Amy Forsyth), Michael (Ellie Desautels), Gordy (Casey Johnson), Jeremy (Sean Grandillo), Annabelle (Shannon Purser ), and others, but for the most part, the show tend to focus on the problems of Lou, Robbie, and Lizette. Annabelle wears chucks while listening to Mr. Mazzu go over his vision for the play. This show combines the musical theatre elements with family drama elements from shows like Friday Night Lights and This Is Us. The bulk of this drama is dealt to Lou, who has to manage his crumbling life at home with the pressures of not screwing up the drama department. His son Gorday is an alcoholic, and is in denial about his disease. Lou and his wife struggle with reaching their son, and Lou’s long hours at work and with the production don’t help matters. Lizette has issues of her own, mostly pertaining from her relationship with her mother. They have financial struggles, which forces Lizette to work a lot of hours at the local diner to help cover rent. This leaves her struggling to maintain her lead role in the play, which she feels could be her way out of Stanton. Robbie’s struggles include his coach berating him for joining the production during football season, and he feels that it will take his focus away from football. Robbie also has a sick mother that he has to take care of, furthering his frustration. During the show’s ten episode season, Lizette is often seen wearing chucks, which fits with her working class, underdog vibe. Other students in the drama department and school also wear chucks, most notably Annabelle. Lizette works at the local diner to help her mom pay the bills. The music in this show is fantastic, as all the actors have real singing chops. Auli’i Cravalho is a standout, which should be no surprise considering her previous work includes providing the voice and vocals for Disney’s Moana. Her performance of “Mama Who Bore Me” is especially touching, and one of the best of the show. Unfortunately, NBC recently announced that they would not be renewing the show for a second season. The show had some issues, which is to be expected from a drama that’s juggling so many moving stories and characters. However this show had tremendous potential, and it’s a shame that we won’t get to see that potential realized. The show is a definite watch for those who love musical theatre, and at only 10 episodes, should make for a quick binge watch.